Caltron has introduced the MP-1080AW and MP-1080HW digital signage media players. 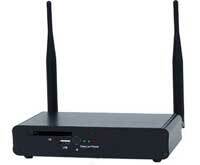 The newest models add the option to send high definition content wirelessly to the digital signage. These accommodate 1080p resolution signals and eliminate the need to connect the player to the display using Ethernet cable. The players are compatible with all of Caltron's existing media playback LCD monitors, and they support MPEG-1, MPEG-2, MPEG-4 (DivX), JPEG, and MP3. They also support FAT and FAT 32 (no NTFS). They use up to 8 GB Compact Flash and support direct memory card file deletion. The MP-1080AW and MP-1080HW allow direct browsing of digital signage content on a TV, a monitor, or a projector. The operator can select disk, folder, chapter, and one-file audio/video playback (such as a single MPEG-2 file). They also provide video synchronization. The AW has DVI and audio out, and the HW offers HDMI. Both come bundled with a remote control, various cables, and the MP-1080A Media Playback System.